This event is for investors only. There is limited seating available and please contact Lianne du Toit with Silicon Cape via lianne@siliconcape.com for more information. 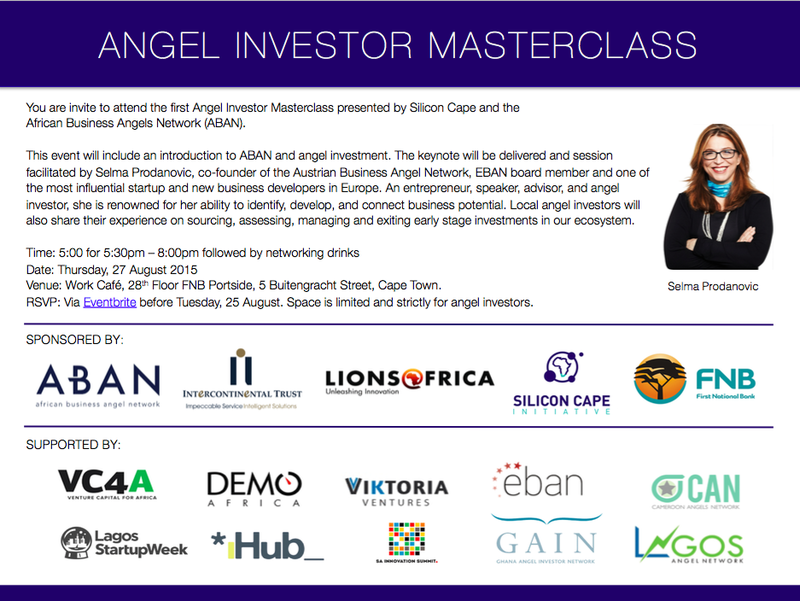 Also known as the Business Angelina or Startup-Grand-Dame, the master class in Cape Town will be conducted by Selma Prodanovic. Co-founder of the Austrian Angel Investors Association, board member of EBAN, founder of Brainswork. Selma received numerous awards, most recently the Veuve Clicquot Business Woman Award. Selma is one of the most influential startup and new business developers in Europe. An entrepreneur, speaker, advisor, and angel investor, she is renowned for her ability to identify, develop, and connect business potential. Selma supported over 300 startups and shaped the growth of the creative industries, the startup, and the business angel eco-systems in Austria and beyond. Selma is founder of Brainswork a most influential startup and investment consultancy acting worldwide. She is co-founder and board member of the Austrian Angel Investors Association and board member of the European Trade Association for Business Angels, Seed Funds and Early Stage Market Players (EBAN). She initiated the one million startups worldwide campaign, established the Brainswork – Make a difference Award, founded IncrediblEurope 2049, and holds advisory and board member positions in a number of companies and organizations. Selma has pioneered various concepts such as Chief Networking Officer, the business development strategy brainsworking, and the Business-Angelina investment approach. An inspiring speaker, Selma was over 1000 times on stage sharing her expertise in entrepreneurship, connecting, creativity, and innovation at universities, companies, and conferences. She edited and published the „Brainsbook on Networking” (2009) and her book “Between Steel and Chocolate – Inspiring Success Stories from Austria” was published in 2013. She was an investor in the Austrian startup TV show “2 minutes 2 million” and has media coverage in over 40 countries. Selma believes that making a positive difference is a fundamental human right. For her innovative approach to business and commitment to entrepreneurship and social change, Selma received numerous awards such as the Austrian “WOMAN Award” in 2006, the “100 World of Difference Award 2013” awarded by The International Alliance for Women in Washington and the “Veuve Clicquot Business Woman Award 2014”. Born in Sarajevo, Bosnia-Herzegovina, Selma lived in several countries in Europe and North Africa and has been based in Vienna (Austria) since 1991. Educated at the University of Sarajevo, Saint Louis University in Madrid, and the Vienna University of Economics and Business Administration, Selma speaks five languages.